Jeffrey Welch's Blog: Water for Dogs: What Type of Water Should Your Dog Drink? Water for Dogs: What Type of Water Should Your Dog Drink? My dog, Chase, hates the water. He won’t get within 3 feet of our pool, and baths are too traumatic to even discuss. But one thing Chase loves is fresh, pure drinking water. And, frankly, that’s the only kind I care about because his survival depends upon staying adequately hydrated. Dogs require more water per day than any other nutrient. It’s no wonder, since 70 to 80 percent of an adult dog’s lean body mass is comprised of water. Let’s talk water for dogs — which type of water is safe for your dog? Which type of water is best? Water for dogs — do you know which type of H2O is best? Photography by Harrison Waters. Is unfiltered tap water safe for dogs? Inexpensive, potable tap water is one of our nation’s privileges but, unfortunately, unfiltered tap water can be riddled with contaminants. The Environmental Working Group (EWG), a nonprofit environmental research and advocacy organization based in Washington, D.C., has found 316 toxins lurking in tap water supplies throughout the country which, according to the Centers for Disease Control, can lead to a variety of adverse health effects, including gastrointestinal illness, reproductive problems and neurological disorders. Contaminants in tap water may include industrial chemicals, pesticides, metals, pharmaceuticals, bacteria, viruses, protozoan, parasites, volatile organic compounds (VOCs), radiological contaminants such as plutonium and uranium and even sewer overflows and wastewater. Need I say more? Bottom line: I do not recommend giving unfiltered tap water to your dog. Should dogs drink bottled water? In 2016, Americans drank 12.8 billion gallons of bottled water. But at nearly 2,000 times the cost of tap water, is bottled water really a purer alternative? Not necessarily. In a 2008 study, the EWG discovered combinations of 38 different pollutants in 10 popular brands of U.S. bottled water. In some brands, the pollutants, which included bacteria, pharmaceuticals, arsenic, fertilizer residue, radioactive isotopes and industrial chemicals, equaled the same level as the country’s most polluted tap water systems. The majority of bottled waters also contain endocrine disruptor chemicals, man-made compounds that interfere with hormone signaling. And plastic water bottles may contain bisphenol A (BPA), an industrial chemical that can seep into the water and is associated with a variety of health risks. Since most states don’t require bottled water companies to disclose the presence of contaminants or the origin of the water, you really don’t know what’s in that bottle. And then there are the environmental effects. Americans use 3 million plastic water bottles every hour, and less than 30 percent of them are recycled. Bottom line: You, your dog and the planet can do better than bottled water. Distilled water is created by boiling regular water to a point where all contaminants are destroyed. The resulting steam is then condensed back into a liquid and bottled. The problem is that distillation also destroys all of the water’s beneficial minerals, which are essential for health. Studies in animals show that consuming distilled water results in a variety of adverse health effects, including a negative balance of sodium and chloride in the blood, lower volumes of red blood cells, increased secretion of cortisol and adverse changes to the kidneys, including atrophy of the glomeruli. Moreover, these changes were not affected even when nutritionally adequate diets were fed. In addition, distilled water is reported to be less thirst quenching, which may lead dogs to drink and urinate excessively. Bottom line: Intermittent or short-term intake of distilled water may not be harmful; however, it should not be used as a dog’s primary source of hydration. Is filtered water for dogs best? As the name implies, filtered water is tap water that has been run through a filter to remove impurities. The most common types of filters include carafe filters, faucet-mounted filters, countertop filters, under-sink filters, reverse-osmosis filters and whole-house filtration systems. Since different filtration options remove different contaminants, the first step is to determine what’s in your tap water. I recommend beginning with an online trip to the EWG’s National Drinking Water Database. Just enter your zip code, select your utility, and get instant access to your water quality report provided by your state’s water officials. You can also call your water utility company for a copy of its Consumer Confidence Report (CCR), an annual report detailing all contaminants present in your local water supply. Once you know what you’re dealing with, the next step is to research the best filtration method to address your specific needs. The EWG’s Water Filter Buying Guide will walk you through this process based on your filtration goals, lifestyle and budget. 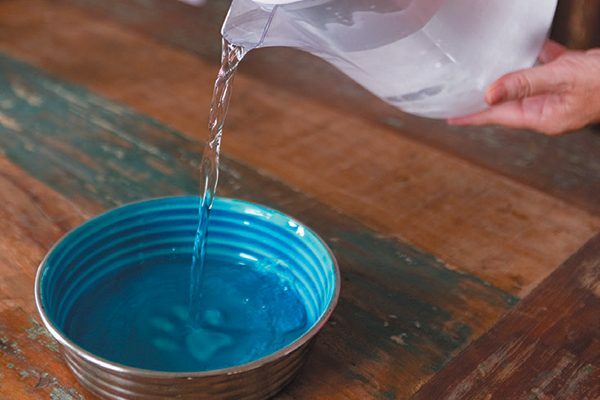 Before you know it, you’ll have an inexpensive, abundant supply of fresh, pure water. Bottom line: A good water filter can turn ordinary tap water into a healthy and cost-effective source of pure hydration for your dog and the entire family. Thumbnail: Photography ©Voyagerix | Thinkstock. Diana Laverdure- Dunetz, MS, is a canine nutritionist and co-author, with W. Jean Dodds, D.V.M., of two books, including Canine Nutrigenomics: The New Science of Feeding Your Dog for Optimum Health. Their online course, Complete Canine Nutrition, can be found at myhealthydog.dog. The post Water for Dogs: What Type of Water Should Your Dog Drink? appeared first on Dogster.